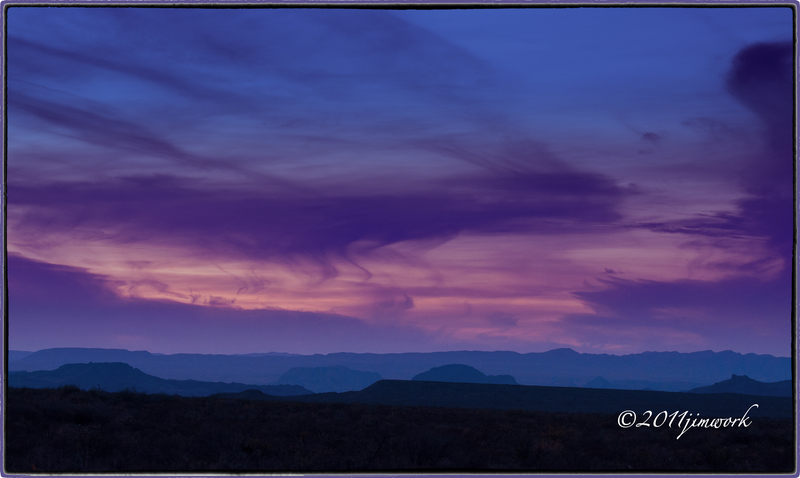 One more from our trip “down south” to Big Bend National Park. We were on the eastern side of the park, awaiting a lunar eclipse that was to happen on the evening of Dec 10. It didn’t take us long to figure out there was way too much cloud cover to expose the moonrise. So we turned west and headed back to Terlingua and our great room at Bill Ivey’s new hotel digs (http://bigbendholidayhotel.com/). At over 800,000 acres Big Bend is a vast park and with a 45mph speed limit we had a good hour long drive to our room. As we headed west, God poured out the paint making up for us missing the eclipse. I accepted the gift and never gave the hoped for red-moon a second thought. Take what you are given. I guess you could say the sunset eclipsed the eclipse. It’s nice that you got shades of purple rather than the usual red and orange.